Did you know? : Of VCU’s last eight games, seven have come against Kenpom top-100 teams. You knew that, right? The Rams went 5-3 against that group. That’s quite the stretch. It’s been over a month since VCU played a sub-200 team, the last time out coming in the form of a 39-point home win over No.274 Binghamton. Tonight’s contest brings another Binghamton of sorts into the Stu when No.259 Louisiana Monroe heads to town. The Warhawks (awesome mascot) have lost all three of their tip-100 contests by an average margin of defeat of 22 points. VCU will be the highest computer-ranked team they will have played yet. The Warhawks are in their seventh season under head coach Keith Richard (no, not Keith Richards…but that would be awesome). Their past two seasons have been that of the 20-win variety and both resulted in some form of postseason play. Richard will hope to do most of the Warhawks damage this season in Sunbelt play after a 5-6 start that includes two wins over DII teams and a recent road win over Coppin State that might as well be a DII team (Coppin State ranks 348th nationally out of 351 teams). The Warhawks are a fairly experienced group, relying mostly on juniors that make up a roster that typically goes about six or seven deep. Six of those players are capable of posting double-digits on any given night with four averaging 10 or more points on the season. 5’11 point guard Nick Coppola runs the show and almost never leaves the floor while 6’6 forwards Travis Munnings and Sam McDaniel do the heavy lifting down low and lead the team in scoring. The Warhawks will roll out one of the smallest lineups VCU will have faced all season, relying on Munnings and McDaniel to clean up the glass despite each giving up about 45 pounds to Mo Alie-Cox tonight. They are occasionally joined by Sam Alabakis, a 6’11 freshman who was averaging close to 20 minutes before a four-minute appearance just two nights ago. Statistically LA Monroe has been pretty atrocious all season long, ranking 290th nationally in effective field goal percentage this season. Despite their size they have rebounded the ball fairly well, which is about the highly positive thing I can say about this Warhawk team. 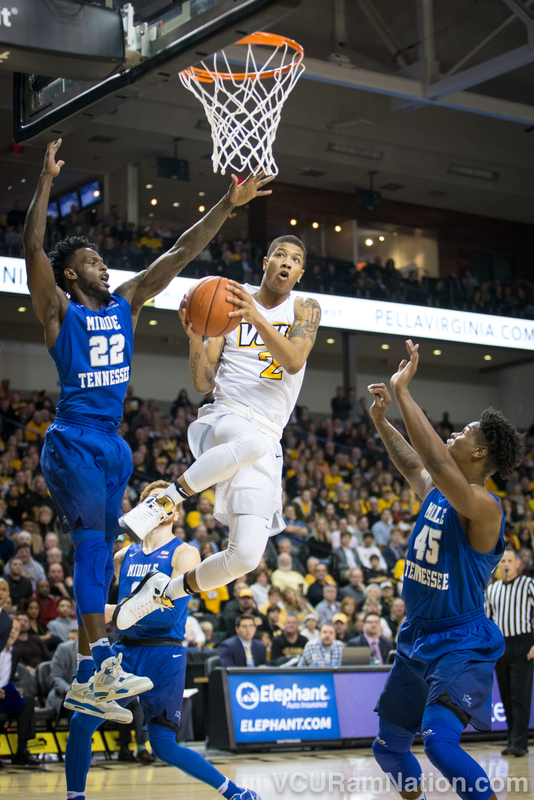 VCU picked up a top-20 RPI when defeating Middle Tennessee State this past Saturday. Despite just a three-point final advantage, it was arguably one of the most impressive efforts by VCU all season. MTSU kept pace by essentially hitting everything from deep (a tip of the hat to them for that, they just made shots), but VCU was able to win by taking a huge step forward in the turnover department. The Rams turned the ball over a season-low five times against an MTSU defense that had ranked in the top-50 nationally before running into VCU. The Rams also did a great job of finishing inside the arc, a point of emphasis all season but an area that had cooled off greatly in over the previous three games, finishing under 50% inside the arc in two losses to Illinois and Georgia Tech as well as in a road win at Old Dominion. VCU will look to do more of the same tonight and will hopefully build a large enough lead to get some confidence-boosting minutes for the Rams’ freshmen class. Gonna stick with my magic numbers of 20 and 12. The Rams basically dominate when connecting on 20 or more attempts inside the arc and when hitting their turnover game goal of 12 turnovers or less. Watch those numbers tonight. VCU actually struggled earlier this season against a Liberty team ranked below Louisiana Monroe, albeit on the road. The black and gold turned the ball over 19 times in the five-point win and accounted for 24 fouls that helped the Flames score 18 easy ones at the stripe. The Rams also connected on just 17 of their two-point attempts. There’s your formula, LA Monroe: forcing VCU to hit anything but the easy ones and hoping the Rams try to force things inside, resulting in a high turnover number. Do that, hit shots on the other end of the floor and you got a shot. Easier said than done for this particular opponent. Kenpom: 78-60 VCU win with a 94% chance of a Rams victory. Watch: CBS 6.3, Official game day headquarters are Buffalo Wild Wings locations at Virginia Center and downtown on Cary Street in Shockoe Bottom.